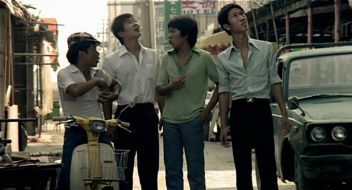 One of the earliest features from Taiwanese filmmaker Hou Hsiao-hsien, The Boys From Fengkuei offers a revealing glimpse into the developmental period of a world-class director. The first shot of this quietly sad film could have been taken from a picture postcard. It depicts the seaside fishing village of Fengkuei, hometown to the protagonists, and signifies the nostalgic tone of what is to follow. As it unfolds, it tracks a group of young men, and Taiwan itself, as they irrevocably move toward a more urbanized society. These boys see Visconti’s Rocco and His Brothers early on, indicating the trajectory of their lives. After about half of the movie, the band of main characters moves from their small home town to the much larger city of Kaohsiung, prompting personal growth but also defamiliarization. Stuck in a no-man’s land between school and mandatory military service, they find themselves unmoored by the massive city, suddenly aware of new yearnings. Thanks to its early exploration of some of the pet themes that would come to define Hou’s career, it stands as a key work in his oeuvre. While the milieu and approach are certainly identifiable as Hou’s, The Boys From Fengkuei shows a director still working to define his particular mastery. Here, the style is mostly conventional, with more cutting, frequent close-ups, less reliance on camera movement, and even a series of flashbacks, which depicts how the father of main character Ah-Ching became an invalid. Furthermore, it’s clearly identifiable as an entry in the coming of age genre, with a narrative trajectory that’s never for a moment obscure, whereas Hou’s later films are more aptly described as a genre unto themselves. Making these comparisons to Hou’s later work is not meant to deride the movie so much as to properly identify it. Boys is quite affecting and well-made, even if it’s not as staggering an achievement of some of Hou’s later movies. After all, while the full power of Hou’s distinctive kind of filmmaking had not yet emerged here, many hints at what was to come are present. Part of two violent scuffles staged early on take place off-screen, leaving the camera to linger on the backdrop as fighting boys drift in and out of the frame. In other scenes, violence suddenly erupts within an extended, still camera framing. Much attention is paid near the beginning to the separation of men from women, which makes the city’s comingling of the two sexes a new phenomenon for the titular boys. In their hometown, the men gathered in pool halls (prefacing the look and feel of one of the sequences in Hou’s later Thee Times), while the women had their own mahjong parties. In the city, the closeness of their living and working arrangements brings a new, co-ed lifestyle and the possibility of romance. There are even trademark Hou scenes in which the characters ride buses and motorcycles, although they are not the extended showstoppers that such sequences would become in Hou’s later movies. Hou’s subsequent films situate themselves at a greater distance from their subjects, which lends them an almost unmatched historical perspective. To some, though, they can feel dispassionate and detached. It’s unlikely that anyone would make such a claim about The Boys From Fengkuei. Although it is imbued with an awareness of Taiwan’s transformation, it simultaneously involves us in the sentimental yearnings of its characters. There are bits here, like the one in which Ah-Ching traces an outline around a dead insect, trapped between a notebook’s pages, and triggers a memory, which would be evocative by anyone’s standards. Fortunately, they are typical of The Boys From Fengkuei’s careful sensitivity.